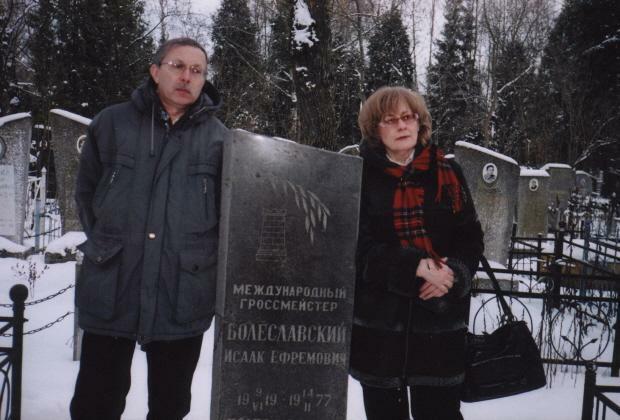 Yakov Zusmanovich (Pleasanton, CA, USA) has forwarded a photograph, received from Sergei Voronkov, of the grave of Isaac Boleslavsky in a cemetery (Чижовское) in Minsk, Belarus. The picture features Boleslavsky’s son, Stanislaw, and his daughter, Tatiana (David Bronstein’s widow). Our correspondent mentions that Boleslavsky’s grave is about ten paces away from that of Bronstein, his son-in-law (see C.N. 5859). 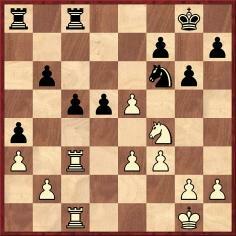 The source indicated (A. Alekhine) is the English-language edition of Pablo Morán’s monograph (Jefferson, 1989). 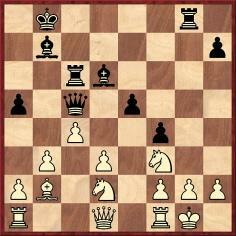 21 f5 Qg3 22 f6 Qf4 23 fxg7 Kxg7 24 Qxf4 Nxf4 25 Nh4 Ne2+ 26 Kh2 Nxd4 27 Rf6 b4 28 Rd1 c5 29 Rxd4 cxd4 30 Nhf5+ Resigns. 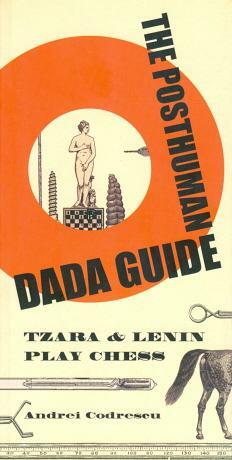 Edward Hamelrath (Dresden, Germany) draws attention to The Posthuman Dada Guide by Andrei Codrescu (Princeton, 2009), subtitled ‘Tzara & Lenin Play Chess’. More information is available at the publisher’s webpage. C.N. 1964 (see pages 350-351 of Kings, Commoners and Knaves) mentioned a number of errors in Le guide des échecs by Nicolas Giffard and Alain Biénabe (Paris, 1993). We subsequently received two pained letters from Mr Giffard, which, without going into the factual issues, expressed an auto-satisfecit. Now a revised edition of the book has appeared, Le nouveau guide des échecs (Paris, 2009), and it is no surprise that numerous mistakes have been left uncorrected. 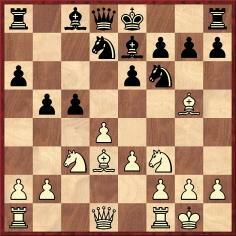 For example, page 44 still claims that Capablanca won an 11-move game against (E.) Steiner at Budapest, 1929. As shown by page 101 of Maróczy and Tartakower’s tournament book, as well as many readily available sources, the game lasted 32 moves. Jan Kalendovský (Brno, Czech Republic) sends a page of cuttings from his archives and asks whether the publication in question (probably dated 1942) can be identified, and whether better-quality photographs can be found. 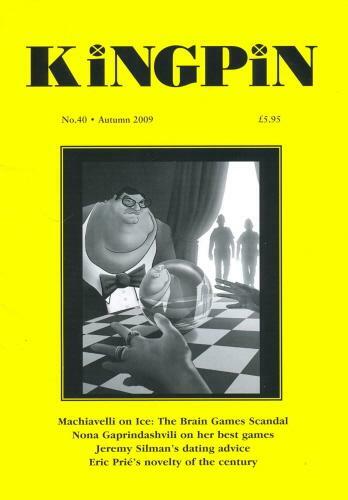 Publication of the British magazine Kingpin is always an eagerly-awaited event. Issue 40 has just appeared and contains not only levity but also some deadly serious investigative journalism. Not to be missed. 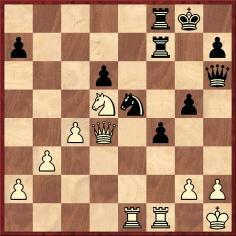 28...g5 29 Nh3 Nd7 30 Rd3 d4 31 exd4 cxd4 32 Re1 Ra5 33 Rxd4 Nxe5 34 Nxg5 Nd3 35 Rxd3 Rxg5 36 Rd2 Rgc5 37 Kf2 Rc2 38 Ree2 Rxd2 39 Rxd2 Rc4 40 Ke3 b5 41 Rd8+ Kg7 42 Rb8 Rc2 43 Rxb5 Rxg2 44 h4 Rh2 45 Rb4 Kg6 46 Rxa4 Rxb2 47 Rb4 Ra2 48 a4 f6 49 Kf4 Ra1 50 Ke4 Ra3 51 f4 Ra1 52 f5+ Kf7 53 Rb7+ Kg8 54 Ra7 Resigns. 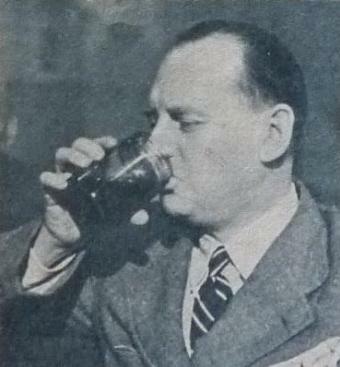 Source: La Vanguardia, 15 February 1935, page 14. 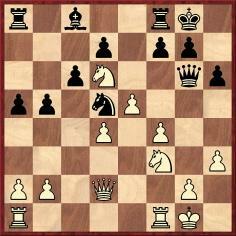 11 a4 b4 12 Ne2 Bb7 13 a5 Rc8 14 Qb3 Bd5 15 Bc4 cxd4 16 Bxd5 Nxd5 17 Bxe7 Qxe7 18 Nexd4 O-O 19 Rfc1 Qd6 20 g3 f5 21 Ng5 Nc5 22 Rxc5 Rxc5 23 Ngxe6 Rf6 24 Nxc5 Qxc5 25 Rd1 Kf8 26 Ne6+ Rxe6 27 Rxd5 Qc1+ 28 Rd1 Resigns. 16 e5 dxe5 17 fxe5 Nfd7 18 Bxb7 Qxb7 19 Bh6 Nxe5 20 Bxg7 Kxg7 21 cxb5 Rfd8 22 Qf4 f6 23 Nd4 Qb6 24 Na4 Qd6 25 Rxc8 Rxc8 26 bxa6 Nxa6 27 Rd1 Kg8 28 h3 Nb4 29 Nb2 Nxa2 30 Kh1 Nc4 31 Qg4 Resigns. Source: La Vanguardia, 22 February 1935, page 12. 16 f5 Ne5 17 Kg2 e6 18 Rf2 b6 19 Qh1 Bb7 20 Qh3 Rfe8 21 Rh1 a6 22 fxe6 fxe6 23 Nh7 Rf8 24 Nxf8 Rxf8 25 g5 Nh5 26 Bxh5 Rxf2+ 27 Bxf2 gxh5 28 Qxh5 Qf7 29 Qxf7+ Kxf7 30 Rh3 Kg6 31 Bh4 Bc6 32 Kf2 b5 33 cxb5 axb5 34 Ne2 Resigns. 19 Bh6 Bc8 20 Rxe8 Qxg3 21 Rxf8+ Kxf8 22 hxg3 gxh6 23 Bxf5 Bxf5 24 Rf1 Kg7 25 Rxf5 Nc7 26 Kd2 Ne6 27 Ke3 Kg6 28 g4 Kg7 29 b3 a4 30 bxa4 bxa4 31 c4 Nc7 32 Kd3 Kg6 33 Kc3 Resigns. The chess column in La Vanguardia was conducted by Ramón Rey Ardid, and in the 1 February issue (page 12) he listed the 13 opponents. The missing game, against Vallvé, was probably published in the chess column of the 8 February 1935 issue, which has yet to be found. 34 Rxe5 dxe5 35 Qxe5 Qg7 36 Re1 Qxe5 37 Rxe5 h6 38 c5 f3 39 gxf3 Rxf3 40 c6 Rf1+ 41 Kg2 Kg7 42 Re7+ Kg6 43 Re2 Rc1 44 c7 Kh5 45 b4 Rc4 46 Re3 Rc2+ 47 Kg1 Rff2 48 c8(Q) Resigns. 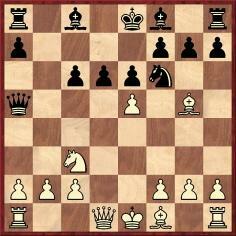 R. Rey Ardid’s Vanguardia chess columns are available on-line. In Spanish: Valentín Marín, José Cabestany, Juan Comas, José Maristany and Rafael Doménech. In Catalan: Valentí Marín, Josep Cabestany, Joan Comas, Josep Maristany and Rafael Domènech. 11...Ng5 (Mr Sánchez comments that the moves in the present score are more logical than the sequence in above-mentioned books, which was 11...Bb7 12 dxc5 Bxc5 13 b4 Bd4 14 Qe1 Ng5 15 Kh1 h5 16 f4 Ne6 17 Qe2.) 12 dxc5 Bxc5 13 b4 Bd4 14 Kh1 Bb7 15 Qg4 Ne6 16 f4 h5 17 Qe2 g5 18 fxg5 Nxg5 19 Bb2 Ne4 20 e6 fxe6 21 Nxe4 Bxb2 22 Rab1 Bd4 23 Nf6+ Ke7 24 Rbe1 Qd6 25 Nxh5 Raf8 26 Qg4 Rxf1+ 27 Bxf1 Bf6 28 Nf4 e5 29 Ng6+ Kf7 30 Nxh8+ Bxh8 31 Qh5+ Kg8 32 Qe8+ Qf8 33 Qd7 Qf2 34 Rd1 Qf7 35 Qd8+ Qf8 36 Qxb6 Qf7 37 Bxa6 Resigns. In the diagrammed position our correspondent remarks that 28 Bh5 wins. Csaba Gerencsér (Veszprém, Hungary) refers us to the webpage of the Hungarian painter Sándor Badacsonyi. The front cover of Mr Gerencsér’s 1995 book Tízezer Lépés Morphyval has a picture by Badacsonyi. See Morphy v the Duke and Count. 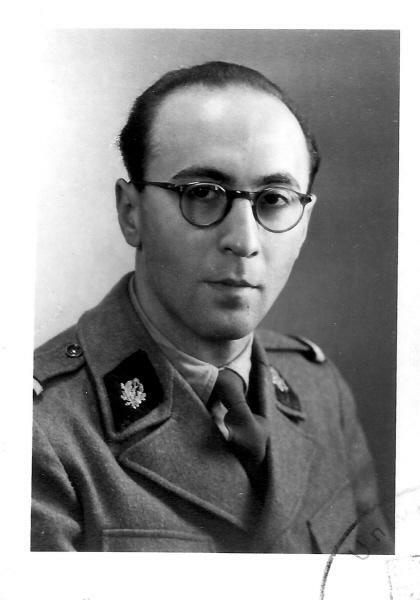 Luis Gavilondo (Madrid) is seeking the score of a game played by his elder brother Enrique (1925-1970) in a simultaneous display against Capablanca in Pinar del Río, Cuba on 8 March 1941. At the time, Enrique Gavilondo was the junior champion of Cuba, and our correspondent believes that the game, a draw, was opened by Capablanca with 1 e3. 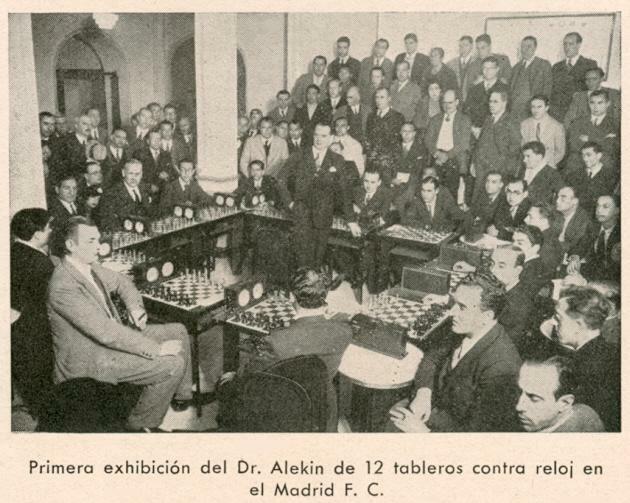 Christian Sánchez (Rosario, Argentina) points out that on page 12 of La Vanguardia, 1 February 1935 the quote ‘El juego de ajedrez es como un narcótico: a pequeñas dosis, placentero; a grandes dosis, pernicioso’ was attributed by R. Rey Ardid to Dr L. Landau, without any further particulars. C.N. 4133 mentioned a Mexican book which ascribed the same sentiments to Salo Landau: ‘El ajedrez es como una droga: beneficioso en pequeñas dosis, fatal en dosis frecuentes’ . (Our translation was: Chess is like a drug: beneficial in small doses, fatal in frequent doses.) 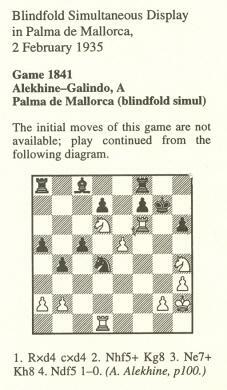 Now, we now note the same Spanish rendition on page 8 of Enciclopedia del ajedrez by H. Golombek (Barcelona, 1980). It was in Wolfgang Heidenfeld’s entry on aphorisms and referred to ‘Prof. Landau’. The index entry in the English paperback edition (page 552) was amended to avoid the confusion with Salo Landau in the hardback. 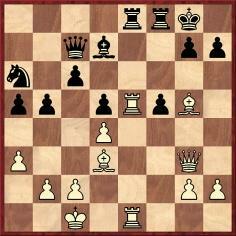 Jeremy Gaige’s Chess Personalia lists four Landaus, including one named Leopold (1848-1920). Can any reader take the matter further? Not least because of the reference to the United States, it would seem highly unlikely that Emanuel Lasker was involved in such an alleged incident, but is any further information available? 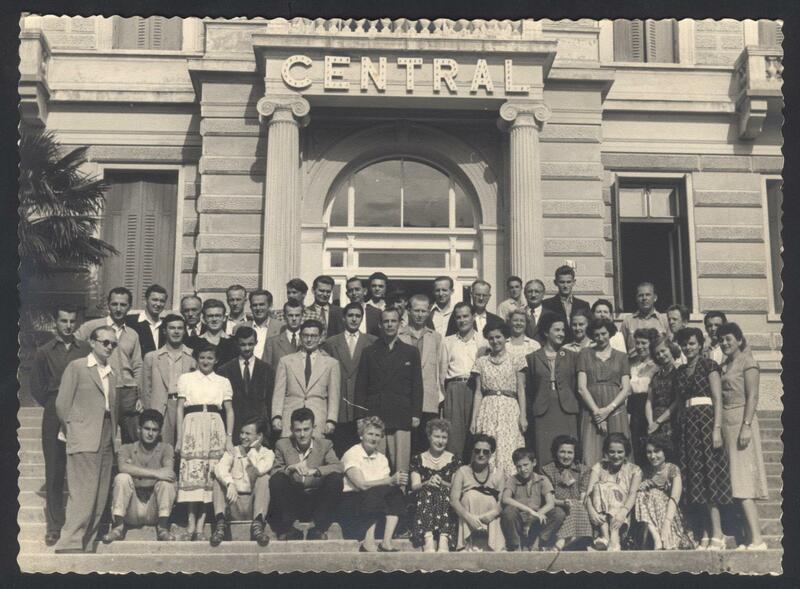 Mark A. Wieder (Midland Park, NJ, USA) sends this group photograph, with an invitation to readers to identify as many figures as possible. 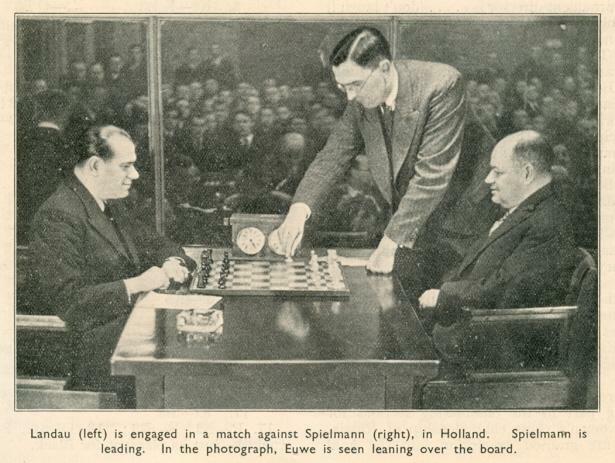 C.N.s 5930 and 5965 discussed two players named Kussman who had games against Alekhine: Leon in 1924 and Abraham in 1929. ‘The C.N. 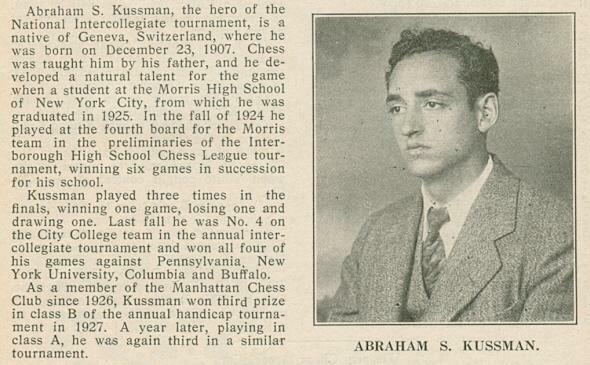 items are correct in stating that it was Leon Kussman, my grandfather, and not Abraham Solomon Kussman, my father, who lost the famous game to Alekhine in 1924. 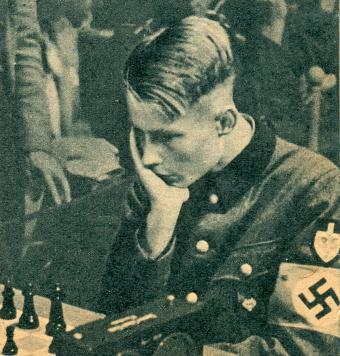 When my father saw that the defeat had been attributed to him, he remarked, “I never lost to Alekhine”. He had played him only once: the 1929 draw which you mentioned. My father was a much better player than either my grandfather or me. At the time he played against Alekhine he was the National Federation College champion. 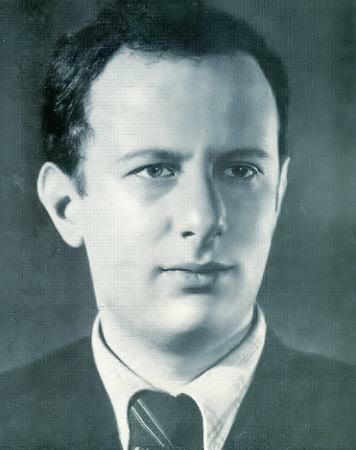 He was born in Geneva, Switzerland on 21 December 1907 and died in New York City on 13 March 1975. Rick Garel (Orillia, Ontario, Canada) asks why Vladimir Nenarokov did not complete the St Petersburg, 1909 tournament. ‘Both tournaments proceeded without any misunderstandings, so that the Appeals Committee had little to do. Although the Committee had been appointed on the first day of play in connection with the claim by Nenarokov – upheld by the Committee – that Perlis had overstepped the time-limit in their game, that first session and the few that followed were concluded within several minutes and did not occasion any further misunderstandings. The most serious cause for discussion and concern was the ventilation fan, which hummed rather loudly while it was operating... From this it is possible to judge the seriousness of the other matters. 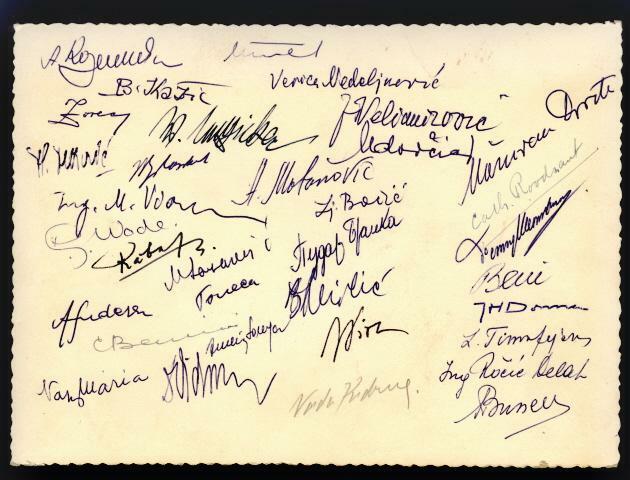 We believe that in the 1930s Emanuel Lasker did not visit the United States until 1937. The reference to Chicago in the above report may suggest a mix-up with Edward Lasker, who lived there for part of his life, but no corroborative evidence has been found so far. In C.N. 1887 George Stern (Canberra, Australia) quoted the entry on chess in the first edition (1771) of the Encyclopaedia Britannica. We commented that we did not envy anyone who tried to pick up the game from it. ‘CHESS, an ingenious game, performed with different pieces of wood, on a board divided into sixty-four squares or houses; in which chance has so small a share, that it may be doubted whether a person ever lost but by his own fault. Each gamester has eight dignified pieces, viz. 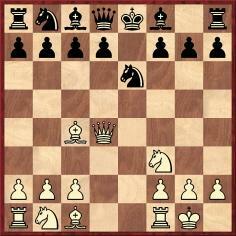 a king, a queen, two bishops, two knights, and two rooks; also eight pawns: all which, for distinction sake, are painted of two different colours, as white and black. As to their disposition on the board; the white king is to be placed on the fourth black house from the corner of the board, in the first and lower rank; and the black king is to be placed on the fourth white house on the opposite or adversary’s end of the board. The queens are to be placed next to the kings, on houses of their own colour. Next to the king and queen, on each hand, place the two bishops; next to them, the two knights; and last of all, on the corners of the board, the two rooks. As to the pawns, they are placed without distinction, on the second rank of the house, one before each of the dignified pieces. Having thus disposed the men, the onset is commonly begun by the pawns, which march straight forward on their own file, one house at a time, except the first move, when it can advance two houses, but never moves backwards: the manner of their taking the adversary’s men, is side-ways, in the next house forwards; where having captivated the enemy, they move forward as before. The rook goes forward or cross-ways through the whole file, and back again. The knight skips backward and forward to the next house, save one, of a different colour, with a sidling march, or a slope, and thus kills his enemies that fall in his way, or guards his friends that may be exposed on that side. The bishop walks always in the same colour of the field that he is placed in at first, forward and backward, aslope, or diagonally, as far as he lists. The queen’s walk is more universal, as she takes all the steps of the before-mentioned pieces, excepting that of the knight; and as to the king’s motion, it is one house at a time, and that either forward, backward, sloping, or sideways. 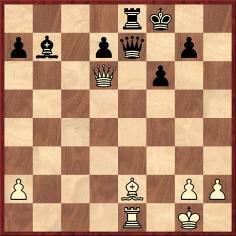 26 Rg1 Rxe3 27 Rd2 Rxd2 28 Qxe3 Rxe2 29 White resigns. Source: Los Angeles Herald, 27 May 1906, page 44. William Hartston (Cambridge, England) informs us that he has just begun a website entitled Wakkipedia. 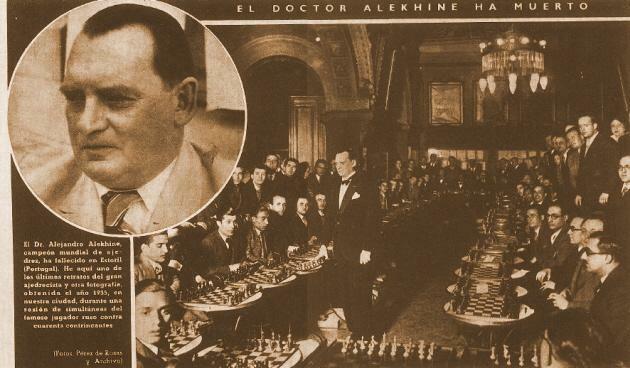 Further to the feature article A Chess-Billiards Concoction, regarding Capablanca v Hagenlocher or Hagenlacher, a well-known chess-billiards anecdote may be recalled, concerning a person who claimed to have beaten leading exponents of chess and billiards, albeit defeating the chess expert at billiards and the billiards expert at chess. Virtually mirthless, the story nonetheless occupied much of the section on Kolisch on pages 40-44 of Chess Life-Pictures by G.A. MacDonnell (London, 1883). The book stated that in Marseilles in 1867 M. Belvoir claimed victory over Berger and Kolisch at chess and billiards respectively. On pages 220-221 of the July 1889 Deutsche Schachzeitung the tale received 38 lines, Marseilles becoming Paris. The French capital also featured in the lengthy rendition on page 192 of Capablanca-Magazine, 15 October 1912. 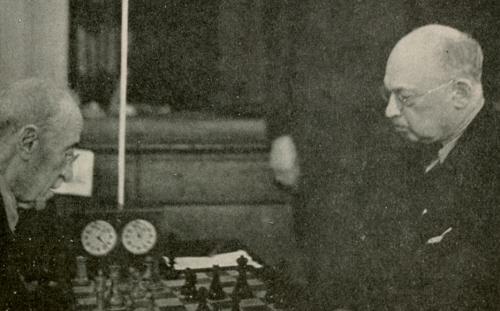 The following year, a version appeared with Steinitz and Roberts representing chess and billiards respectively. The person who defeated them was named as George E. Walton, the President of the Birmingham Chess Club. 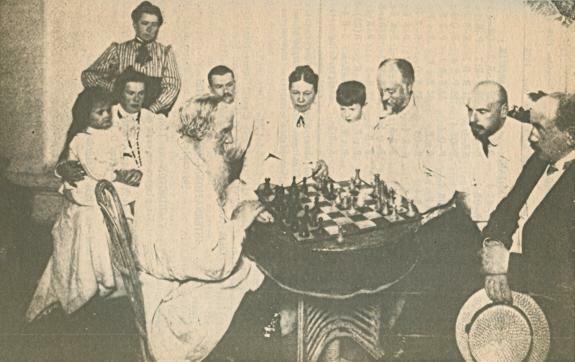 See ‘Billiards and Chess’ by Robert J. Buckley on page 90 of the April 1913 American Chess Bulletin. 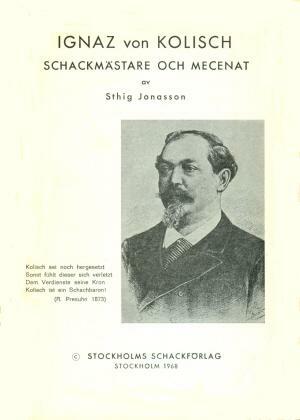 The yarn is, though, most commonly associated with Kolisch, and it appears on page 37 of Ignaz von Kolisch schackmästare och mecenat by Sthig Jonasson (Stockholm, 1968). Paolo Ciancarini (Pisa, Italy) asks for information about the inventor of Kriegspiel, Michael Henry Temple, of whom a photograph was given in C.N. 3487 (from the December 1928 BCM). That issue of the magazine (pages 448-449) carried Temple’s obituary, and we shall be grateful for any biographical details that readers can add. Who originated the aphorism, ‘Never miss a check, it might be mate’? The earliest documented reference known to us is the Liverpool Weekly Mercury of 8 November 1890, quoting from the Birmingham [Daily] Gazette. The remark was attributed to Blackburne, at a simultaneous exhibition in Birmingham in 1890. By the time of his death, the remark ‘Never miss a check, it might be mate’ was routinely being ascribed to Blackburne (e.g. 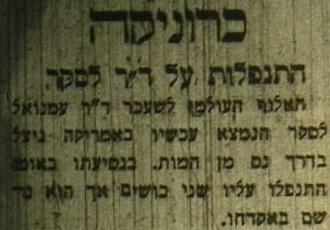 BCM, October 1924, page 401). ‘Evidently, according to the popular rule, “never miss a check”.’ Westminster Papers, 1 March 1876, pages 223-224. Note in the game Mason v Bird, New York, 13 December 1875. ‘On the principle, “never miss a check”. 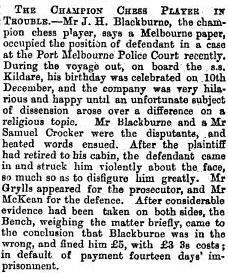 White’s game is now hopeless.’ Chess Player’s Chronicle, 22 October 1884, page 169. ‘Never miss a check! 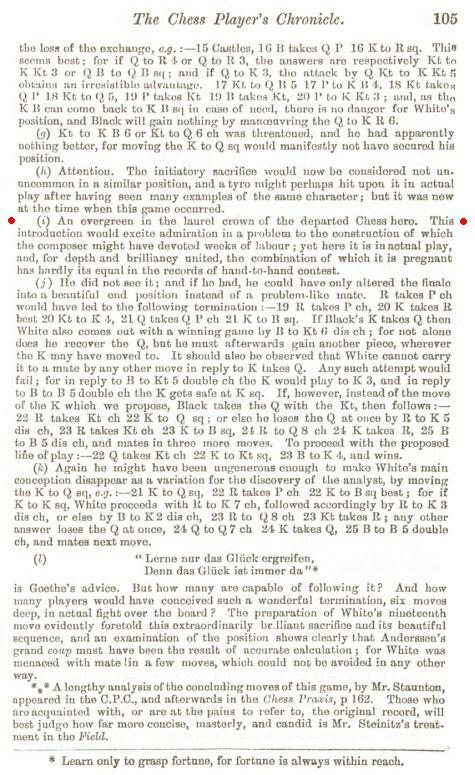 This check, however, is unintelligible to us, for its only effect is to weaken Black’s game.’ Note to a move in the game Lord v Ranken, on page 176 of the February 1885 Chess Monthly. ‘“Check!” “Check!” Yes, never miss a check; and don’t fail to send a check to renew your subscription to the Chronicle.’ Advertisement on page 202 of the Columbia Chess Chronicle, 29 December 1888. ‘“Sir”, I said, “I never miss a check; it may be mate.”’ Annotation in an unsigned fictional feature ‘Mate in Nine Moves’ on pages 438-439 of the November 1901 BCM. ‘Here the temptation to attack is too alluring, besides Black may have remembered the saying, “Never miss a check, for it may be a mate”. 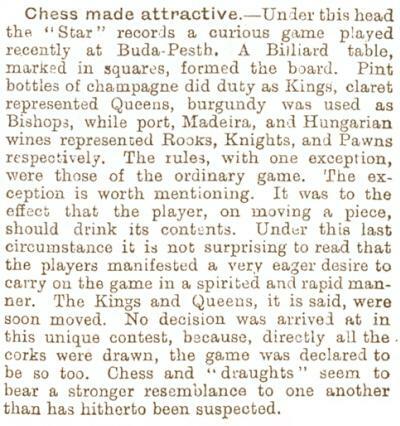 Chess Weekly, 14 August 1909, page 94. ‘The author himself has given it an appropriate motto, “Always check; it might be mate”.’ Discussion of a problem by A.J. 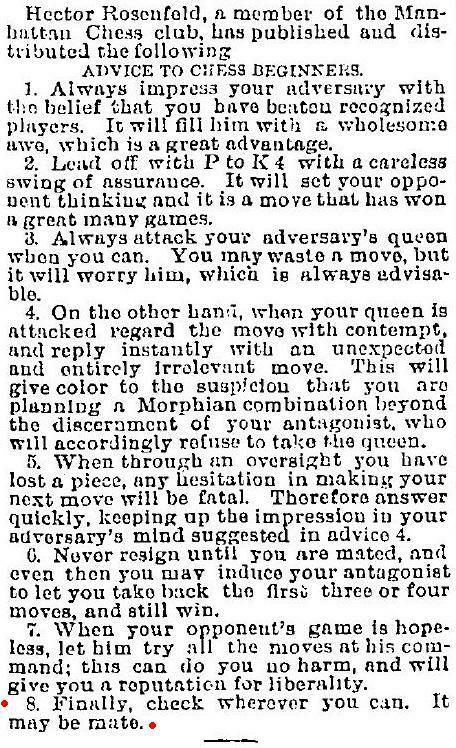 Fink on page 159 of the July-August 1915 American Chess Bulletin. 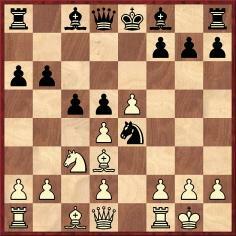 The composition (‘the most humorous position that has ever been set upon a chessboard’) was given in C.N. 2048 (see page 26 of Kings, Commoners and Knaves). ‘Avoid giving useless checks. We do not agree with the player who said, “Always check – it might be mate”.’ Chess by David A. Mitchell (Philadelphia, 1917), page 56. Is any further information available? F.D. Yates: ‘He died in debt.’. ‘I qualified as an International Master at Hastings, 1979-80 at the age of 14 (I was born on 1 June 1965), and my title was ratified by FIDE at its Congress in Malta at the end of 1980. Before that time, had anyone obtained the IM title at a younger age? ‘As far as I know, the earliest source of the game is Deutsche Schachzeitung, September 1852, pages 338-339, and October 1852, page 383. The game was then picked up in the Chess Player’s Chronicle of 1853, pages 4-11; in none of these cases was the venue indicated. Kleines Lehrbuch des Schachspiels (sixth edition, 1892), page 98. In Der praktische Schachmeister (Hamburg, 1865) even the names of the players are absent, and the game does not appear in Theoretisch-praktisches Handbuch des Schachspiels (Berlin, 1863) or Schachfibel (Styrum and Leipzig, 1888). Even Hermann von Gottschall’s Adolf Anderssen (Leipzig, 1912) gives only the names of the players, without any place or date. See page 110. We note that on page 19 of the monograph A. Anderssen 151 partier by L. Collijn (Stockholm, 1918) the game was headed ‘Berlin, 1852’, but what precisely can be found in nineteenth-century sources? 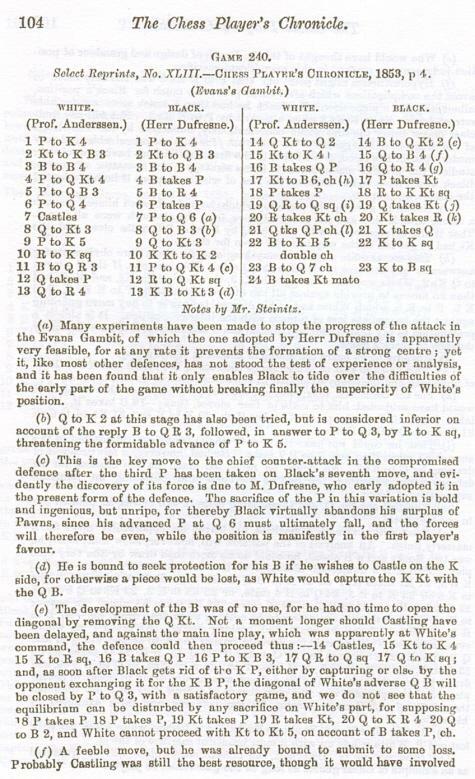 An article entitled ‘Reminiscences of German Chess’ by Jean Dufresne was published on pages 1-6 of Brentano’s Chess Monthly, June 1882. It contained much of interest regarding his encounters with Anderssen, although no direct evidence about the Evergreen Game. For the time being, we merely offer a miscellany of general jottings on the game, and readers are invited to supplement them. Anderssen v Dufresne was undated, but the venue was given as Berlin. 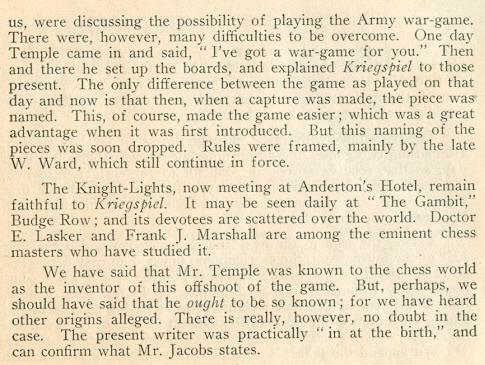 In item 171 of unit two of Napier’s Amenities and Background of Chess-Play (New York, 1934) W.E. Napier described 19 Rad1 as ‘A move in a billion’. The date 1853 was also given in both editions of Anne Sunnucks’ Encyclopaedia of Chess but is, of course, incorrect (the game having been published by the Deutsche Schachzeitung in 1852). Dufresne was not identified. 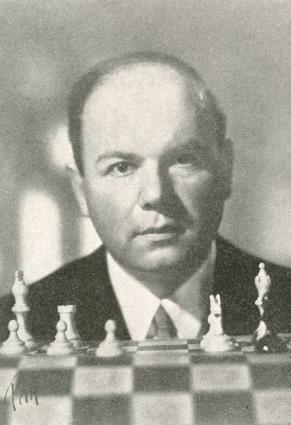 Nor was he on page 91 of James Mason’s Social Chess (London, 1900), which merely stated that the contest, ‘Known as “The Evergreen Game”’, was ‘won by Anderssen’. However, Dufresne was mentioned when the finish to the game appeared on page 218 of Mason’s The Art of Chess (London, 1895), but the word ‘evergreen’ was not there. The same text was attributed to Steinitz by Chernev on page 230 of The Chess Companion (New York, 1968). What more can be found in Steinitz’s writings? In particular, what details can be traced further to Chernev’s statement that Steinitz used the specific term ‘evergreen partie’? 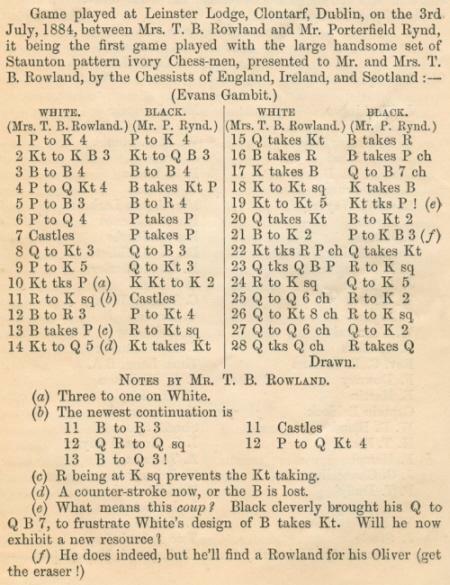 The following article is reproduced from pages 43-44 of our publication Chess Characters, volume two by G.H. Diggle (Geneva, 1987), having originally appeared in the Christmas 1986 issue of Newsflash. Known as the ‘Badmaster’, Diggle, a quintessentially English writer, was aged 84 at the time. ‘The Badmaster, though now retired from chess polemics, has received a kind invitation from the Editor to send Acrimonious Greetings for Christmas 1986. 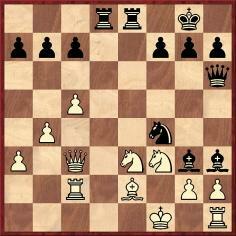 In response to numerous anxious enquiries from pseudonymous admirers (such as In Zugzwang, Three Pawns Down and Just Fools-mated) the BM is pleased to report that, like Captain Corcoran, “he is in reasonable health” and happy to sit reading Newsflash each week and watching the Chess World go (or rather whizz) by with momentous British triumphs and weekend tournaments springing up, in and out of season. As one of these (Brighton, 1986) landed right on his doorstep, the BM actually tottered down to “The Old Ship” and entered for one of the side-shows. As his last appearance in a South Coast Tournament occurred 47 years ago, it was like leaping a two-generation gap and landing on a new chess planet. The BM had innocently expected to encounter grave adversaries in sober attire who had procured respectable weekend apartments on the Sea Front (Visitors are requested not to play the piano on Sundays, etc.). Instead, half the opposition came roaring in for the day on old bangers and motorcycles – several wore jeans and ate lunches out of rucksacks. Their style of play, too, the BM found (to quote Boden’s old joke) was “a stile he couldn’t get over”. None of them had ever heard of P-K4, and whenever the BM “occupied the centre” they either crawled around the side of it and mated him in the corner, or undermined it by some system of remote control, picked up no doubt from the latest “Batsford”. Still they were generous victors – “Hope I shall put up as good a fight when I’m your age, sir!” Indeed, all was cheerfulness and Coca Cola. The organizers were as good-humoured as they were efficient, and W.R. Hartston’s “serious lunch-time talk” was punctuated with laughter which would have “excited the admiration” of Terry Wogan. But, as Sir Robin Day would point out, the topic under discussion is not the BM, but Christmas. Has Britain ever celebrated a great Chess Christmas, one coming immediately on top of a National Chess Triumph? For a collective triumph one has to go back only two years (Salonika, 1984) and even this may soon be “old hat” for as the BM writes this we are already in the lead at Dubai. But for an individual triumph, it seems we must go back to 1843, when on 20 December, after 14 hours’ play, “Mr Staunton achieved his 11th and final victory in Paris”. As London and Paris were still unconnected by rail or telegraph, the news had to come ploughing across The Channel, and reached the Press only two days later. “The Englishman’s victory”, says Murray, “was received with great enthusiasm, and Staunton was fêted on his return”. Yet owing to the unexpected vicissitudes of the course of the match, he only just got home in time for Christmas. He had been “gloriously successful at the onset” and by 9 December led +10 –3 =2. At this point Staunton’s two seconds, Captain Wilson (indisposed) and Mr Worrell, returned home, “laissant à leur Champion la tâche facile d’achever un ennemi expirant” (Le Palamède). But St Amant, like Karpov in the late great struggle, refused to “expire”. Though one bad move would have cost not only the game but the match, he played with superb accuracy and sang froid through five more games covering 278 moves in all. 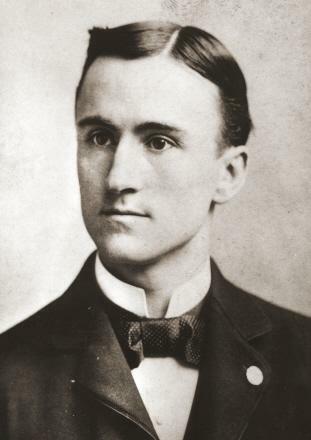 Staunton’s substitute second and admirer, the American amateur Thomas Jefferson Bryan, was so alarmed that to boost his hero’s morale he collected several English friends in Paris to turn up and “show the flag” at the 21st game. Staunton then pulled himself together and produced (in Ray Keene’s opinion) one of his four greatest games. The match ended in a blaze of goodwill, Staunton being delighted with his victory and his opponent with his great stand at the end – “J’ai sauvé l’honneur”. 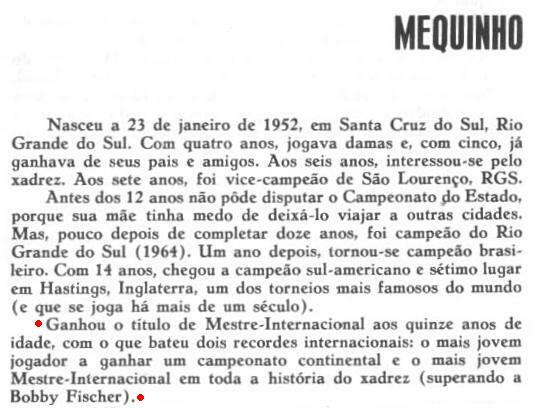 ‘According to Henrique Mecking – see page 9 of his book O Encontro do Século Fischer x Spassky (São Paulo, 1973) – he obtained the title of International Master at the age of 15, breaking two records: the youngest player to win a continental championship and the youngest International Master ever (bettering Bobby Fischer). We note that according to page 116 of the April 1967 BCM the play-off event was held from 25 January to 4 February 1967. The reference to Fischer in the above book by Mecking prompts us to raise another question. By finishing equal fifth in the Portorož Interzonal tournament in August-September 1958, Fischer qualified for the following year’s Candidates’ event and automatically acquired the title of Grandmaster. See, for instance, page 195 of the October 1958 Schweizerische Schachzeitung (a particularly reliable periodical for administrative matters) and page 25 of Profile of a Prodigy by Frank Brady (New York, 1973). 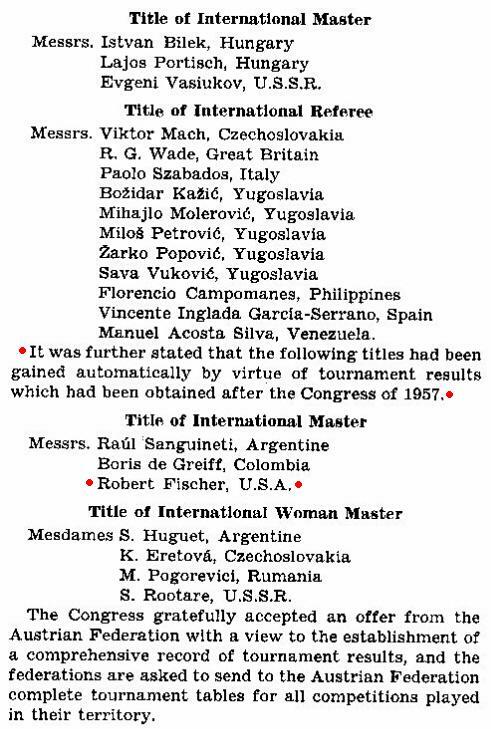 But did Fischer obtain the International Master title the previous year? 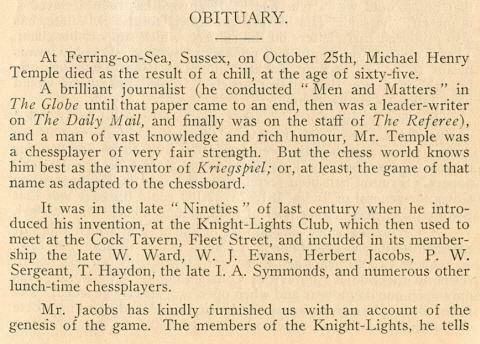 His entry in Jeremy Gaige’s Chess Personalia states that he did, and he was also mentioned as a recipient in 1957 on page 41 of the Livre d’or de la FIDE (Sutton Coldfield, 1977). 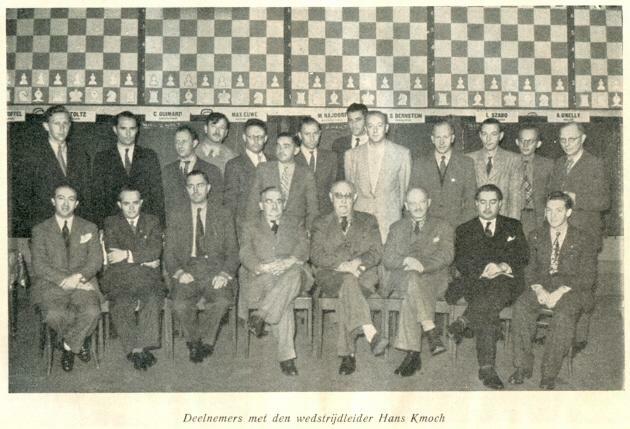 However, Fischer was not listed among the new title-holders in the reports on FIDE’s Congress in Vienna (18-22 August 1957) which were published in, for example, the Schweizerische Schachzeitung (September 1957, pages 178-180) and the BCM (October 1957, pages 268-269). 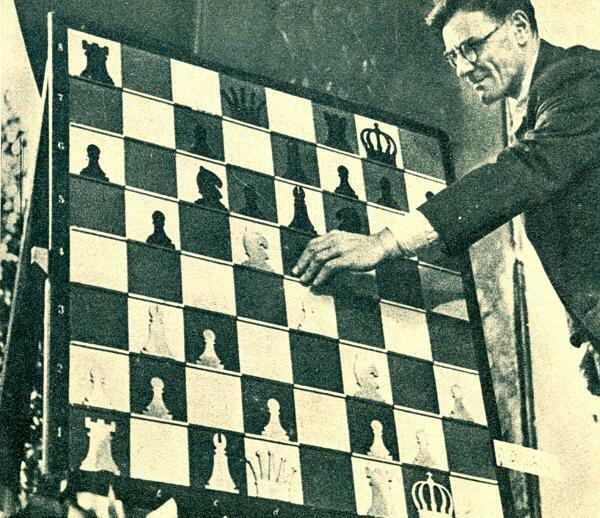 The photograph above, from page 81 of the March 1958 Chess Review, shows Fischer in play against Abe Turner in the final round of the 1957-58 US Championship in New York. 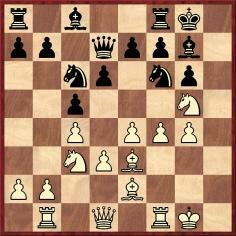 What was the largest number of opponents ever faced by Morphy in a simultaneous exhibition? 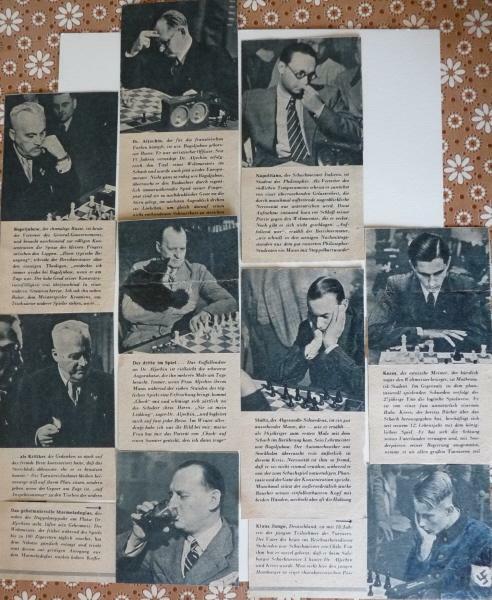 ‘In this first-round photograph (also published opposite page 32 of the book 20 grote denkers binnen Neêrlands grenzen by Peter van Foreest) the master furthest away in the left-hand row is Smyslov, playing against Vidmar. Then come Steiner, Botvinnik, Denker and (in the foreground with his back to the camera) Guimard. In the right-hand row, the first (front) master is Christoffel (back to camera), in play against O’Kelly. At the next board is Kottnauer, playing against Bernstein. Then come Yanofsky, Kotov at the board with Stoltz and, finally, Flohr. Standing behind Flohr seems to be Tartakower and behind him, on the left, Kmoch. Standing behind Botvinnik’s board, with his hands in his pockets, is Najdorf, and behind him is Euwe. 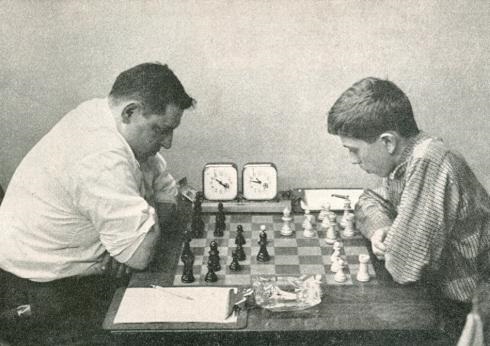 Between the boards of Botvinnik and Denker, Lundin is standing on the left, and Szabó on the right. That leaves Boleslavsky. He is to the right of Najdorf and behind Szabó. 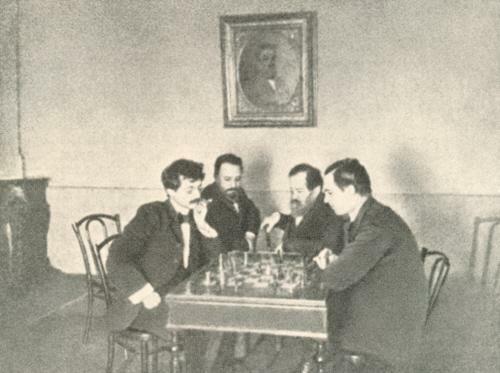 In the first photograph Guy Brunet (Montreal, Canada) suggests that the figure on the left watching Botvinnik’s game is Alexander Rueb. 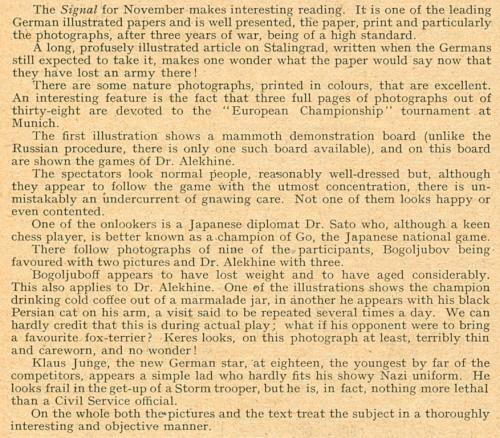 Further to the feature article Tolstoy and Chess, our correspondent Henk Smout comments on the famous photograph above (which we take from page 337 of The Gambit, November 1928). 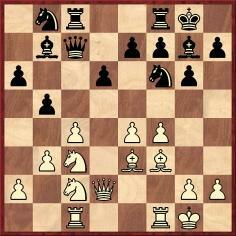 He notes that the board position arises after the moves 1 e4 e5 2 f4 exf4 3 Nf3 g5 4 h4 g4 5 Ne5 h5 6 Bc4 Nh6 7 d4 d6 8 Nd3. 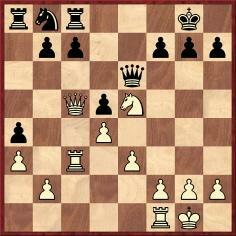 7 Ne5 Nxd4 8 Bxf7+ Ke7 9 Bg5+ Kd6 10 Nc4+ Kc6 11 Bxd8 Nxc2 12 Rc1 Nxa1 13 Ne5+ Kb6 14 Rxc7 d6 15 Rc6+ Kb5 16 Nc3+ Kb4 17 a3 mate. Page 179 of Los principios del ajedrez by Ramón Rey Ardid (Saragossa, 1939) gave the players’ names as Schleem and Waray. Databases and other sources (which may have a different order for moves 3-7) have White’s name as Schlemm and Black’s as Waranay, Wraney or Wrany. According to pages 93-94 of the June 1899 Wiener Schachzeitung White was H(einrich) P(hilipp) Schlemm (1813-1901), and his opponent was Samuel Wranay. We draw together, rather guardedly, the strands of the discussion so far on the competing claims (Fischer, Mecking and Short). In each case, the date of accession to the IM title is taken to be the conclusion of the event in question. The alternative is to use the date when FIDE officially made the award at its annual congress, but that would seem arbitrary and unfair (because the gap between the over-the-board achievement and the FIDE congress could range from a few days to nearly a year). Further evidence regarding Mecking’s IM title would also be welcome. With respect to both Fischer and Mecking, does any reader have access to FIDE’s working documents and reports? More generally, what were the rules on the awarding of the IM title for performances in Zonal Tournaments? Short qualified as an IM at Hastings, 1979-80, at the age of 14 years and seven months (C.N. 6419). 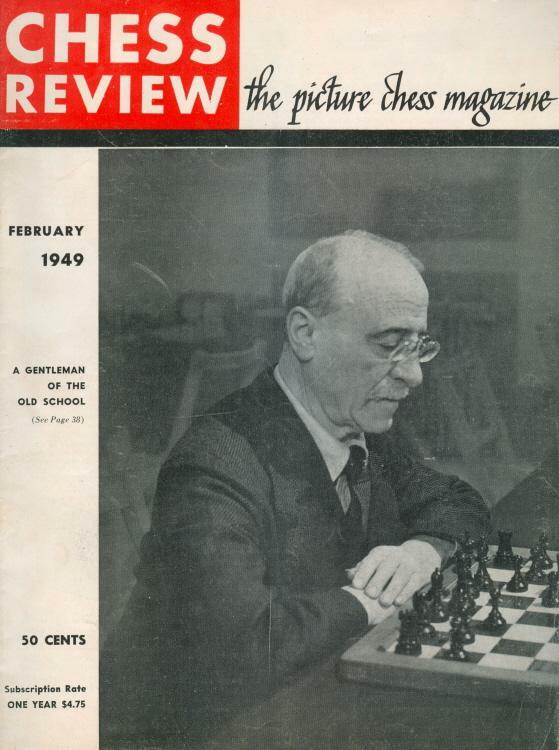 ‘My Most Exciting Game’ was the title of an article by Mieses on pages 280-281 of CHESS, 14 April 1939. 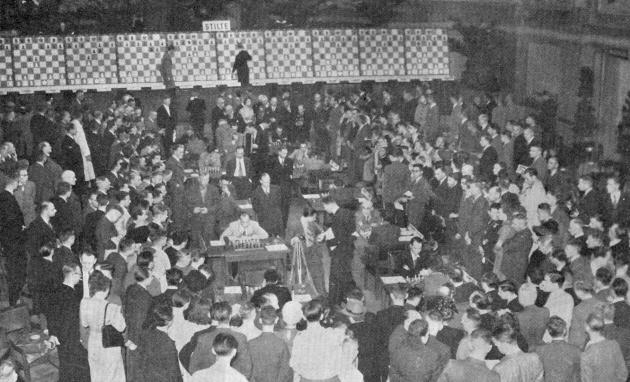 He selected his win over Curt von Bardeleben at Barmen, 1905 – ‘it holds as much interest and excitement as I would ever wish to experience’. Mieses added that ‘Curt von Bardeleben at his best was one of the strongest players of all time’. 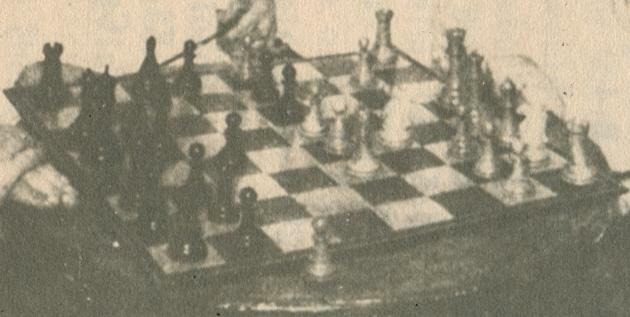 This photograph of Mieses in play against Tartakower at Hastings, 1945-46 was published on page 7 of the January 1946 Chess Review. 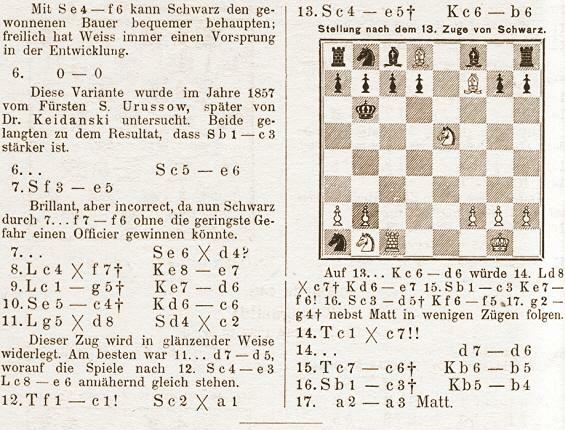 Some other sources – such as pages 44-45 of the fifth edition of Kombinationen by Kurt Richter (Berlin, 1978) – state that the game occurred around 1906. As a curiosity, we note that on pages 5-6 of The Treasury of Chess Lore (New York, 1951) Fred Reinfeld reproduced the maxims with the erroneous source ‘Chess Review, 1938’. In fact, they had been given on page 8 of the January 1933 Chess Review (without any indication that they were over 40 years old). Regarding the 22/1942 issue of the German magazine Signal Alan McGowan (Waterloo, Canada) and Hans Secelle (Schelderode, Belgium) report that they have the Dutch-language edition. We recently picked up the Swedish version. Flemming Larsen (Copenhagen) asks about the existence of pictures from St Petersburg, 1895-96, and particularly shots of Lasker and Pillsbury. 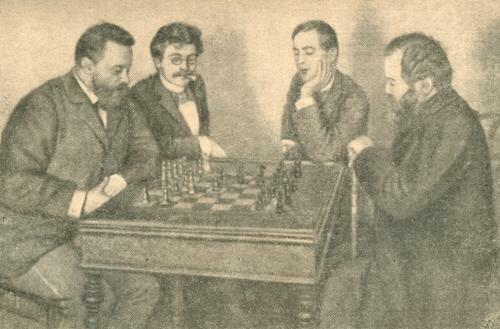 Page 69 of Chess An Illustrated History by Raymond Keene (London, 1990) had a photograph whose caption begins, ‘Under the remote gaze of a picture of Steinitz, Emanuel Lasker faces Harry Nelson Pillsbury in a game in 1896 in St Petersburg’. However, the photograph (which also shows a picture of G.H. Mackenzie on the wall) was taken at the Manhattan Chess Club. For purposes of comparison, see the illustrations in the February 1898 American Chess Magazine, as well as the photograph of Pillsbury at the Club on page 52 of A Picture History of Chess by Fred Wilson (New York, 1981).